One would hardly argue that it is very important to control your bankroll, keep losses down and make the playing time last longer while gambling at slot machines. The fame of one-armed bandits is negative as they bring nearly 70% of the total casino income every year. 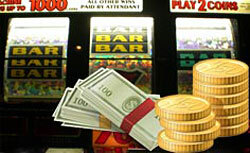 But if to behave attentively and rationally you may leave the casino with some lucky earnings in your pockets. A common slot machine scenario experienced by millions of gamers is when you insert a coin/token/ gaming ticket, pull the lever/press the button that starts the reels and win nothing. Every slot player should keep track of such situation in order to make their gambling bankroll last longer. Along with other strategies available for slot players, an option known as “naked pulls” helps to save your cash and get away from one-armed bandit before you lose it all. “Naked” here means “nothing” while the word “pulls” stands for “plays”. If a gambler is getting no return over a few series of plays, it would be better for him/her to get away from that slot machine. In order to identify a naked pulls number select a numeral between 7 & 14. It is necessary to provide the slot game with at least 7 pulls, but if the quantity of naked pulls has risen above 10, it is better to quit. Let’s suppose that you made up your choice and picked up a 10 as a naked pulls number. When you will come up to 10 pulls without any positive outcome, you’d better finish the gaming round. Do not hesitate to make another pull that “may be a lucky one”, simply quit playing and leave the casino as this “one more” may lead to serious consequences and leave you penniless. Unlike other slot machine strategies, naked pulls tactic intends moving from one slot machine to another which may seem inconvenient for the first time. On the other hand, it is better to quit when you reach the established limits and understand that today is simply your unlucky day. Give it a try another day and the fortune may favor you. This strategy may be very valuable for players who are having problems with planning their gambling bankroll. In fact, knowing when to stop and quit is essential taking into account the reputations of one armed bandits and the tendency to leave the casino after losing all the money. Keep track of your expenses and enjoy reasonable gambling.